Managed Profile is one of the products which are dived into the gap of Profile Problems. 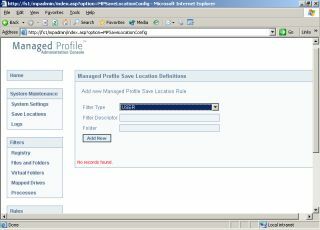 Managed Profile uses its own technique, depending of a MS IIS and MS SQL (or MSDE) server. Besides profiles Managed Profile also has build in functionality for user registry settings and printer management (this printer management is only available on customer base). In comparison with the other installations, Managed Profile has a very different installation structure. No setup, with next next next buttons, but a installation document which manual steps must be done. Not that simple for an inexperienced user, but easy to script the installation steps to set it up unattended. First you need to create and fill the database on the SQL server. The manual is very short and if you never worked with SQL scripts it is pretty though. In the version we downloaded the third script gives a couple of errors. After filling in the support form on the internet side we had a very quick reaction on solving the errors. After the database is created the IIS server need to be installed. This "installation" is just copying two directory to the server, make them available within IIS (with read and script execute permissions) and setting up a System ODBC connection to the database. In one of the files of both sites (dbconnect.asp) are set hard coded parameters like SQL user, password and database name. After changing this manual the website works. On the Terminal server only one executable needs to be copied. This executable needs to be run when the user logs in or logs off (so a very good place for this executable is the logon and logoff scripts). The installation of the PrintGUI installation is based on the same steps. After contacting Managed Profile they told me that the next installation version has a much more intuitive configuration process. After changing the dbconnect.asp it is possible to start the admin web console. You need to secure this webpage, because otherwise everyone can change the settings. The console is divided in three parts, System Maintenance, Filters and Rules. With System Maintenance you can set the general settings for Managed Profile like the default save folder and save location. You can specify the save location on group, user or machine basis. If you don't specify any location the settings are automatically stored in the Terminal Server home drive of the user. The separate save location is a good configuration option, in this way you can store the data in such way the users can not accidentally delete it. - Registry settings; Here you can save and restore registry keys. You only need to specify which registry key (with the good advise to be specific as possible) and give the setting a unique name. This is the same functionality as FPK or Simplify Profiles. - Folders and Files; With this option you can specify which folder needs to saved and restored. In fact this replaces the redirection option within policies. - Virtual Folders; Virtual Folders are shortcuts to shares which directly appear under My Computer. - Mapped Drives; Just maps a drive letter to network share, normally done within a logon script. - Processes; Need an application or executable to start when the user logons or logs off then specify it here. Although there is not much to specify you need to do it all manual, like filling the registry key of specify the network share (there are no browse functionality). All settings need to have an unique name. After setting the rule you need to set a filter to activate the settings. You can activate (in other words filter) the application for all, group, user or machine basis. It is a pity you need to specify the name manual. Very important that you need to give the users Backup files and directories, Restore files and directories user rights, otherwise the registry files can not be imported and saved. When the PrintGUI add-on is installed you also got one additional part. With a utility you can import all printers from a server into your Managed Profile database. Within the admin console you then can assign printer(s) to ADS groups or the other way. Managed Profile has logging possibilities which are defined in System Maintenance. You can choose three logging options; Critical, Intermediate or Verbose. The logged data can be viewed in the admin console. It is also possible to give a parameter with the mplogon.exe (the executable on the TS which loads and saves the settings). This parameter enables a log file in which makes it possible to exactly follow the process of loading or saving the settings. This log file (on server base) is placed in the save location specified. Like the other Profiles programs. Users will be pretty happy, because they have no profiles problems anymore, but still get their own settings back when they log in. If the additional PrintGUI is installed the users get a additional application which replaces the Standard Windows Printer applet. If the user chooses Add Printer, only the printers will be displayed, which were assigned to the groups to which the user belongs. The tool don't have a universal printer driver, so the printer driver itself need to available on the TS server itself. Manage Profiles is one of the competitors in the profile market. In comparison with FPK and Simplify Profiles Manage Profiles offers the most options to configure like drive mappings, virtual folders and "folder redirection" en simple printer settings all from one single point of administration. By the use of IIS and SQL the environment is scalable and can have a high availability. Unfortunately configuration could be improved with browse buttons and drop down boxes. At the moment Managed Profile installation is mainly on customer base, so installation is not just pressing the next button a few times. Marcorp definitely needs to improve the installation to (it was the first installation we need assistance of the manufacturer, the reaction times on e-mail are very very good) set this software on the market as standard product. Again these profile products are pretty the same in functionality, so decisions need to be made on additional options, purchase costs and the way configuration is done.